Innovative data-driven strategies are enabling organizations to connect with customers and increase operational efficiency as never before. These new initiatives are built on a multitude of applications, such as big-data analytics, supply chain, and factory automation. On average, organizations are now 53% digital as they create new ways of operating and growing their businesses, according to the Computerworld 2017 Forecast Study. 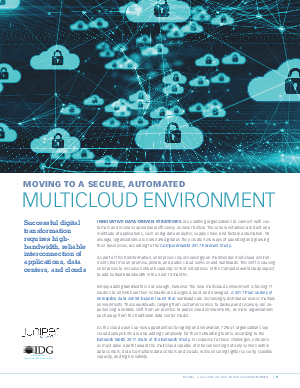 As part of this transformation, enterprises rely increasingly on multivendor, multicloud environments that mix on-premise, private, and public cloud services and workloads. This shift is causing enterprises to increase network capacity; 55% of enterprises in the Computerworld study expect to add network bandwidth in the next 12 months.